Well, it’s the beginning of my second year in school administration. After 23 years in the classroom and one year of administration under my belt, I feel a little more confident in my new role. Last year was a total mind shift for me. It was also a year of learning and adapting. I’m grateful to the many school administrators who have shared their experience and expertise online. I have subscribed to many of their RSS feeds, and I have learned so much about what it takes to be successful in this position. I’m always checking my Feedly iPhone App to see what new posts I can read. As part of the beginning of a new school year, my principal held a meeting for all the teacher leaders on campus. That is, she invited the team leaders and department leaders, along with the admin team. Her goal was to begin the year with some policies in place that would help make the year run more smoothly. At the end of last year, our former principal (We have a new principal this year.) conducted a survey of the teachers, asking them for feedback on how the year went. The results of that feedback identified a few areas where the teachers felt there could be some improvement. Our current principal used this first meeting of the year to try and come up with strategic policies that would help improve those areas that were identified in the feedback results. We expected the meeting to be a bit contentious, since we were dealing with staff complaints, but I was pleasantly surprised. It was a great meeting. The teachers proposed ideas; the administration shared their point of view, and together we came up with a definite direction as to what we need to do to change those weaknesses into strengths. The principal used her position to facilitate the discussion, organize the comments on large posters on the wall, and keep us from deviating from our focus. I was very impressed with the way the meeting was conducted. I learned a lot. I assumed that the responsibility to tell the staff what we as a school are going to do would fall on the administration. I was surprised by the willingness of the teachers to be the one to take on that responsibility. Teachers quickly volunteered, and I was a bit relieved. 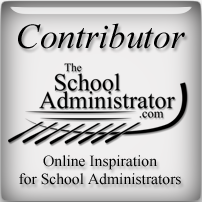 Although most seasoned school administrators probably already know this, I learned that when sharing a new policy or direction for the school, having a fellow teacher share this information will have a greater effect than if coming from administration. Unfortunately, there is always going to be an us-versus-them mentality between the teachers and administration. Some schools have it worse than others, but whatever the case, having a fellow teacher demonstrate his/her personal buy-in to this policy will go along way to convincing other teachers to buy-in as well. It also demonstrates that an administrator values the leadership abilities of the teacher. To give away that “time behind the podium” shows that we are a team working together for the benifit of all. 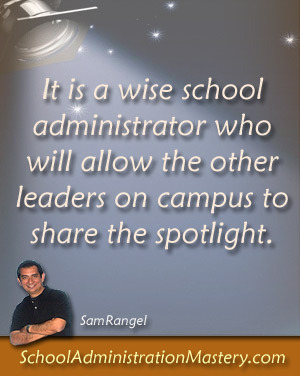 I know some school administrators love to be the center of attention in staff meetings, but I believe it is a wise school administrator who will allow the other leaders on campus to share the spotlight. You can be the best motivational speaker in the world, but if you are still considered one of them, you’re not going to be as effective as a teacher speaking as one of us. I hope that made sense. This is one strategy that I will take with me as I continue my journey toward School Administration Mastery. If it was, please share, tweet, or pin. You can also subscribe to my RSS feed here.